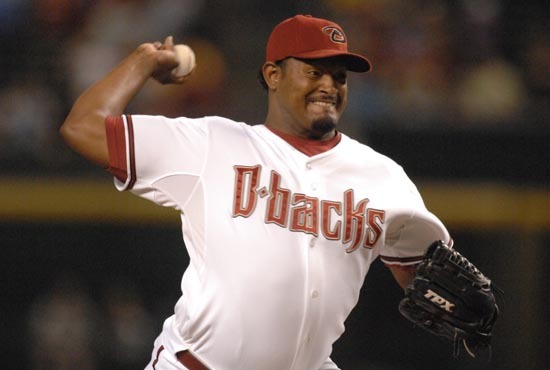 For five seasons, he won the hearts of Arizona fans with his electric fastball and entertaining antics on the mound. He led the league in saves with 47 in 2007, and the flamethrower’s eclectic arsenal of pitches made him the dominant closer in the D-backs’ bullpen. Now four years after moving on from Arizona, Jose Valverde is back in the desert, this time as an American League All-Star with Detroit. The right-hander has locked down 24 saves in 39 games this season, earning him the third All-Star nod of his nine-year career. Although he departed the Valley of the Sun via trade several season ago, Valverde is thrilled with his return to Chase Field. After being signed by Arizona as an amateur free agent in 1997, the former D-back made his Major League debut in 2003 and quickly became a fan favorite. When he was selected to be a member of the American League’s pitching staff, Valverde was excited by the notion of returning to Arizona. Valverde tallied many memorable saves in crucial situations during the 2007 season. His success on the mound helped propel the D-backs to a 90-win season and the franchise’s fourth National League Western Division championship. The D-backs handed the Cubs a three-game sweep in the Division Series before seeing their season end against Colorado. It was his performance in that postseason that provided Valverde with his favorite memories in a D-backs uniform. There were an abundance of crucial saves and exciting performances from Papa Grande. While he didn’t want to leave the D-backs, he realized that trades and transition are a part of the game. Since leaving Arizona, he’s notched an impressive 119 saves with a 2.91 ERA. In 229 innings, Valverde has fanned 241 batters. He’s a Tiger now, and it’s likely that his name will be called as the American League’s closer in Tuesday’s Midsummer Classic. The opportunity to face off against the National League is an exciting one for Valverde.